It seems like daily that I discover a great new skincare brand on Instagram. 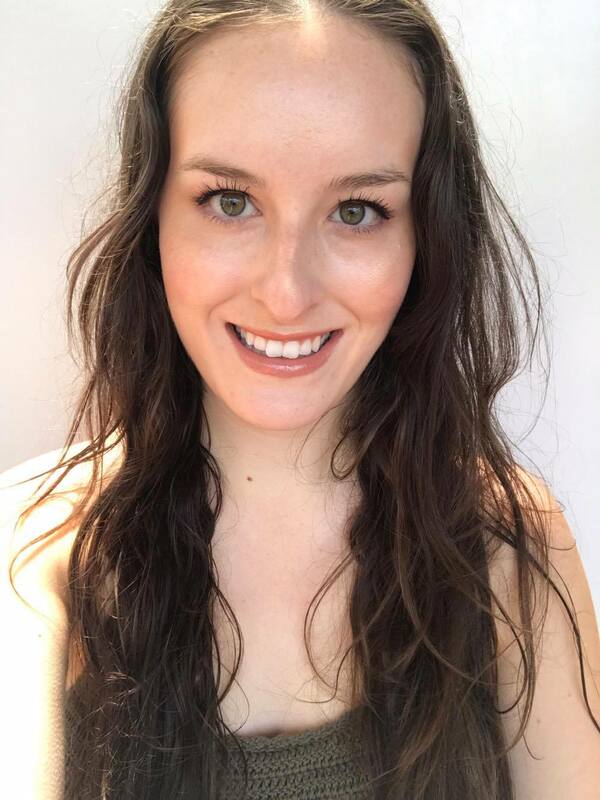 The green beauty community is growing rapidly and brands are following suit. Recently, I came across a new-to-me natural skincare company called Natural Bridge Health. Natural Bridge Health products are formulated and lovingly created by Bridget Carmady; a naturopath, in the Blue Mountains in Australia. 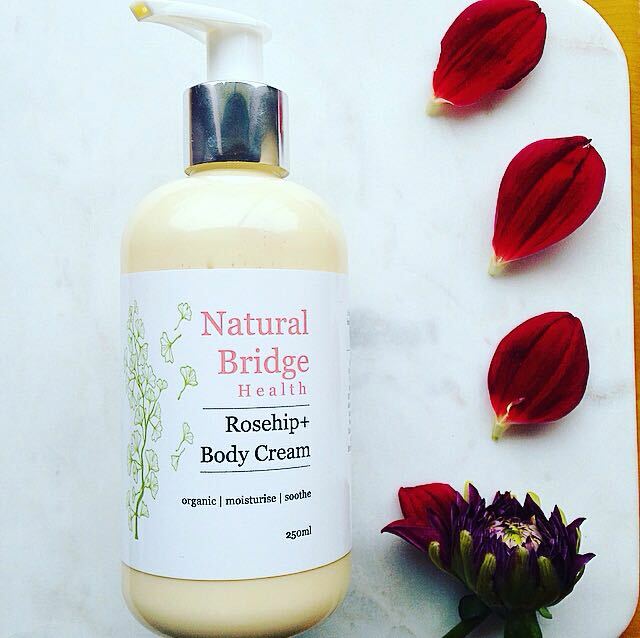 I reached out to Bridget and she was lovely enough to offer to send me a full-size bottle of her Rosehip+ Body Cream to try out and review for you guys. Rosehip+ Body Cream comes in a clear pump bottle which allows you to see the beautiful pale yellow cream housed inside. The packaging looks quite elegant to me, and I have to say, it would look beautiful displayed in a bathroom. This body cream, as its name suggests, comes packed with Rosehip oil. Rosehip is a beautiful oil packed with massive benefits for your skin. Boasting healing, regenerative, anti-ageing, and anti-inflammatory properties, rosehip oil is THE oil for targeting scarring, ageing, sun-damaged skin, pigmentation and wrinkles. It contains omega fatty acids, vitamin A and vitamin C, and is deeply hydrating. Rosehip+ also contains calendula extract. Calendula is a known skin soother; offering antioxidant and anti-inflammatory benefits and encouraging wound healing. Rosehip+ contains macadamia nut oil. Macadamia nut oil is similar to the sebum naturally produced by our skin, encouraging skin hydration and absorbability. Rosehip+ smells of lavender, sweet orange and bergamot, but it is a light scent that disappears quickly, which I appreciate. Lately, I seem quite sensitive to scents of all kinds; natural and synthetic, and cloying ones tend to give me a headache. I have been reaching for this cream because it smells beautiful but doesn't irritate me or give a headache! The texture of Rosehip+ is on point. It is soft, creamy but rich, and deeply hydrating, without the greasiness or stickiness. It absorbs quickly into my skin after my morning shower and I find I can get changed immediately, without having to wait a few minutes for my skin to dry (with other creams). As someone with really dry skin, I appreciate Bridget's ability to make a moisturiser that effectively hydrates the driest skin without any oiliness/greasiness. Thankyou! 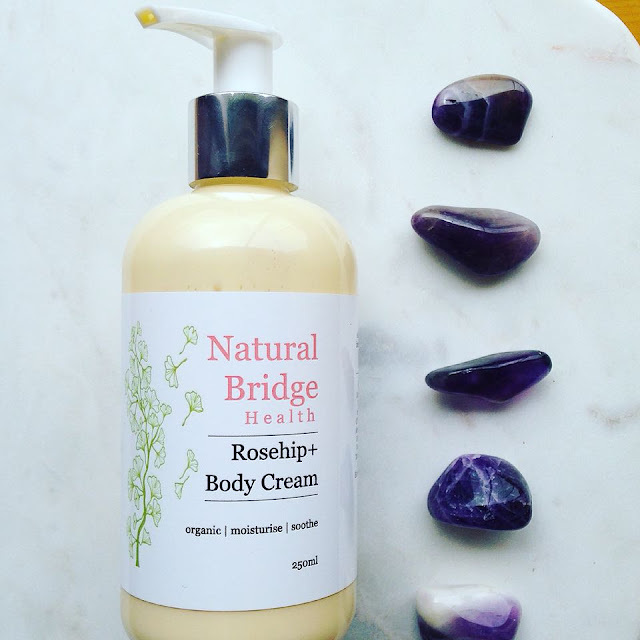 Rosehip+ Body Cream was the first product I have tried from Natural Bridge Health, and it has made me curious about Bridget's other offerings. She has a range of Face, Body, Bath, Baby, Men and Herbal Teas. I definitely would recommend trying out Natural Bridge Health products. You can really feel the love she puts into her products, and I love supporting Australian brands. You can find Natural Bridge Health products at their website, here.